Will China Housing Market Follow the U.S. In a Mortgage Bust? As the second largest global economy and one that is growing in the high single digits to low double digits, how China goes so goes the global recovery. A property boom is helping to fuel the Chinese economy. Some analysts claim many new Chinese property owners are encouraged to take out mortgages to buy a home that they can ill afford. Sound familiar? Is China following the U.S.’s example, issuing mortgages that they can cover? If this is true it will bring down the rapid growth of China and the rest of the world suffer. After all China is the economic engine for the global growth story. A fair amount of the recent growth in China comes from home construction. This property boom is helping China achieve unprecedented growth rates in the high single digit to the low double-digit rates. Housing is the best hope for sustaining these gains, according to the World Bank. Wang Shi, head of China’s largest property developer, China Vanke Co, said in December 2009 that China risks a Japanese style property bubble if the rapid price gains continue. A study by the Bank of Japan concludes that China resembles Japan in the 1970’s when Japan had a strong demand for housing fueled by the fast growth and rapid urbanization. Debt exposure is reasonable. Home ownership in China remains a dream for the vast majority. Many of the people in the cities live in dormitories provided by their employers. Many of china’s homebuyers are young. China’s “one-child” policy is helping these new workers to afford a new home. They count on their doting parents to help come up with the necessary down payment. Traditionally, Chinese young people look to relatives to help cover some of the costs of home ownership. This continues today. In addition, the average mortgage is for less than 50 percent of the value of the home. This motivates the homeowner to evaluate carefully the price they are paying for their home. It also provides a cushion for the bank should the price of the home fall. Outside China’s largest cities, prices for homes are much lower. In addition, most homeowners paid cash for their homes or tapped friends and family, avoiding a mortgage. With so many Chinese in cramped, shoddy flats provided by their employer or the government, many Chinese are keen to buy a home. Their high savings rate helps them to find something affordable. In the U.S., many loans came with little or no money down. These homeowners have little or no financial stake in the price they paid for the home, a contributing factor to the mortgage crisis. Prices of new residential homes are rising at a 20 percent annual rate. Higher valued apartments in the big cities are climbing even faster. These price increases are encouraging developers to add to the housing inventory. New construction fuels the demand for workers and raw materials helping the economy’s growth. Koyo Ozeki, head of Asian credit research for PIMCO says the comparison to Japan’s real-estate boom is not realistic. Japan had a much more mature economy in the 1980’s. China is a young economy that remains well below the living standards of the developed world. The growth in incomes will continue to drive the demand for new housing. The risk is developers are focused on building homes for the upper income buyers. Serving this smaller segment of the population raises the concern of a housing bubble. While a sizeable market of 120 million people, some analysts worry that the potential to overbuild for this market will cause a slow down in the Chinese economy. The Chinese government is responding to these concerns of the rising home prices. However, they want to avoid the crash in house prices that occurred in 2007 and 2008. Their present goal is to increase the supply of lower priced housing. The problem is many Chinese cannot afford to buy a home without assistance. Homebuyers in China are accustomed to paying reasonably large down payments in the 20 to 50 percent range. Unlike the U.S., large down payments provide a cushion against any drop in the price of a home. To place pressure on the high end and drive away speculation, China’s policymakers are raising the down payments and mortgage rates for high-end homes. In the big cities experiencing rapid price escalation, out-of-towners cannot get a mortgage until they have paid local taxes for at least one year. If a buyer is purchasing a second home they must put down at least 50 percent. In Beijing they cannot buy a third home even it is all for cash. These policies are causing the price of high-end homes to slow their climb and in some cases fall. In Tongzhou, prices fell 13.4 percent since mid-April according to the Beijing Times. China is a long way from reaching the mortgage crisis of the U.S. Their policy and tradition of paying mostly cash for their homes, taking on minimal debt, limits the risk of a significant mortgage bubble. A comparison to US ratio of housing loans to GDP is still only 15.3%, compared with a peak of 79% in America, shows how far China is from the problem in the U.S. The Chinese housing boom is not causing a mortgage crisis similar to what occurred in the U.S. 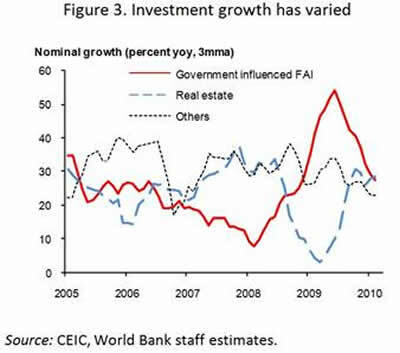 Fear that a slow down in the the growth in housing will cause China to falter is real. Though the affect of any slow down will be relatively small. With China growing at approximatley 10 percent per annum, a slow down of 2 percent means the country’s GDP remains at a rapid growth rate. Actually, any slow down by China is welcome news as it will lower the risk of overheating. Growth in China remains the driver for global growth. China’s expansion of housing has a long ways to go. While there will be volatility in the market for homes, the growth in the number of new homes remains up. This trend will drive demand for many commodities important to home building including copper, steel, and energy. The Wall Street Journal Online, “China Seeks to Tame Boom, Stirs Growth Fears”, Andrew Batson.